This project contributed to the main focus for the year, and 340 children and young people directly benefited from it. The aim, which we achieved, was to ensure further development and consistency in delivering regular dance workshops, for a longer period of time to groups who were classed as ‘disadvantaged’ or ‘at risk’. In total seven groups benefited from the project; Blackfriars Special School & Further Education Unit, 3 of C.E.D.A.R.S pupil referral units, which are for pupils who have been permanently or temporally excluded from school, The Play Council - Knutton & Cross Heath, and Chesterton Youth Club. This took the form of after school clubs, evening workshops and extra curriculum activity. The groups chose to perform in a number of different ways. This included performances in front of their peers, their own and at other schools and to family & friends. The project also created volunteer opportunities for disabled and non-disabled dancers and students to assist the workshop leaders in the workshops. This project was developed to create a contemporary dance film project (dance, music & film) between students from Blackfriars Special School & Cedars Pupil Referral Unit. IGNITE! Funded by Robbie Williams’ Give it Sum was our first cross-generation integrated dance project. It was supported by The Stoke-on-Trent College and Princes Trust Millennium Volunteers and Sally Rew (who at the time worked for ACE) commented that it was the best integrated project she had seen to date. An age range of 16 to 65 and of all abilities took part which culminated in a new dance work which was created & performed along-side professional dancers from FRONTLINEdance. Two paid trainee's also joined the professional team for the project. 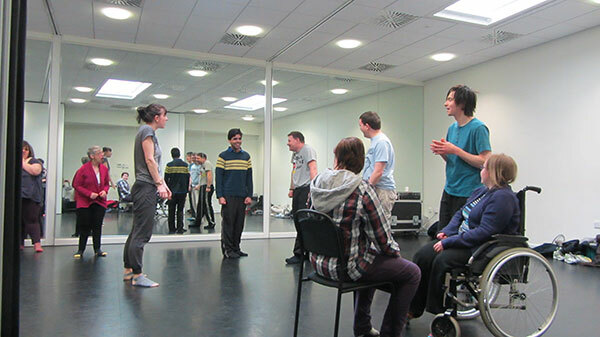 In 2008 we set up TRANSCEND to ensure that FRONTLINEdance can facilitate the need of young disabled artists who want a career in dance but cannot, for very individual reasons, access university courses to fulfil their dreams. This continued until 2013 where it became ‘Breakthrou’aDvANCE’. Since it started trainees have taken part in regular workshops – shadowing and assisting, playing a vital and important part in our education & outreach work. They take part in technique classes, make their own work and perform. The frequency of this depends on the type of projects we have running. In 2013, Transcend became a 12-week programme for adults with a disability funded by the European Social Fund. Its aim wasn’t to create new jobs, but to give disabled people new skills and the confidence to find and keep jobs. 32 individuals took part in our pilot project with 4 participants taking part in more than 1 programme and 4 being invited to volunteer on the programme. We used Creative Dance, Voice & Speech, Drama and Role Play, to provide new skills and to increase confidence in order to allow each participant to take their next step into work; whatever that may have been. 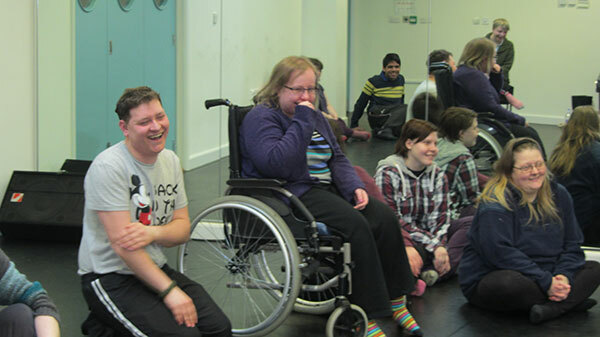 FRONTLINEdance was able to develop a strong partnership between Staffordshire County Council’s learning disability employment team and being funded by The European Social Fund has meant that we have been able to reach the employment sector and new organisation of those who work with adults with disabilities (including mental health). FLD have been working with older people since 2007 (though as a freelancer our Artsitic Director has been for a longer period of time and has completed the Mark Morris ‘Dance For Parkinson’s’ training programme, and Beth Johnsons ‘Active In Age’ course). Moving Together was created following an Outreach Programme to our 5th Anniversary Tour where we worked with Trinity Day Opportunities in Stafford. A successful result has meant many projects that have developed and grown over the years. It was originally a partnership with Staffordshire County Council Day Opportunities in Stafford, Stone, Eccleshall & Meir Heath (which grew to two extra rural care settings in Stafford) up until the council closed down there day services for older people in 2011. However our relationship continued with the groups, as individual staff set up their own day care services. Moving Together exists to improve the Health and Well-Being of older people through the delivery of regular movement and dance sessions and much needed social interaction. The sessions mainly focus on gentle exercise, falls prevention, postural stability, mobility, the engagement of body and mind, social dances, interaction, enjoyment, structure and improved memory. The main aim is to enjoy and achieve together demonstrating the powers that dance can play. In 2012 the regular sessions had a change of focus when our Artistic Director came up with the concept & idea to create a light-hearted contemporary dance film, ‘Pack up your troubles’. It promoted positive images of older people and integrated a group of dancers (60yrs to 97yrs ) from 3 different settings together. September to October 2015 to celebrate ‘International Older Peoples Day’, our Artistic Director created a new work to be performed at PMAG as part of the Live Age Festival. It engaged an intergenerational & integrated team of dancers (15yrs to 66yrs) with live choral accompaniment and delivered workshops. FLD are an active partner of the Live Age Festival steering group. 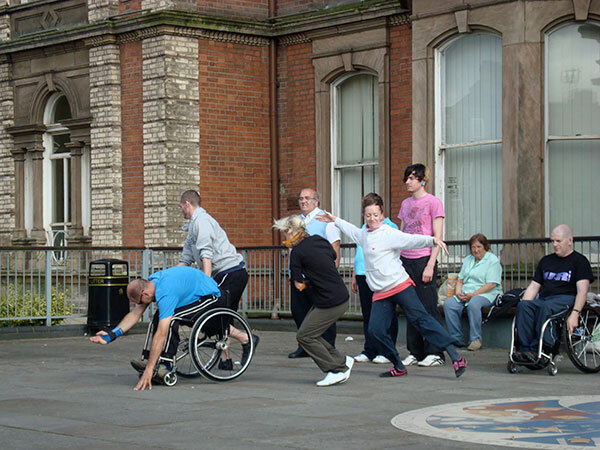 In 2008 FRONTLINEdance was asked by ACE West Midlands to work with local companies to create a site specific performance project; A ‘Game of 2 Arfs’ was created. It saw the community of Stoke-on-Trent engaged as participants and audiences in a professional dance performance with poetry, music and theatre. This contemporary dance event animated public spaces in the town centre of Hanley, Stoke-on-Trent. The project included professional performances which were interweaved between 6 community groups that we formed especially for this project. The project was very well received by the City Council, venues/partners, those who work in the city and members of the public. A need has been found for the city and this project must be built on in order to bring accessible arts to the many and to support the regeneration of the people and livelihoods in its fullest meaning. To celebrate our 5th Anniversary, Artistic Director Rachael Lines, in collaboration with musicians Mr Will & Paul Rogerson, created ‘Sacred Place’; a new piece of integrated contemporary dance, which was then toured throughout Staffordshire. The Tour was a huge success reaching 9 artists, 80 participants and 1,150 audience members. It allowed us to tour to 8 venues and work with six different groups as part of our outreach work. The groups consisted of youth clubs, day centres and disability groups, which provided us with a diverse group of young people, adults and older people. Participant’s age ranged from 12-91 yrs. The tour was made possible by funding received from the National Lottery through Arts Council England, Awards For All, Stoke-on-Trent City Council, Staffordshire Moorlands District Council, Reginald Johnson Foundation and the Strasser Foundation. 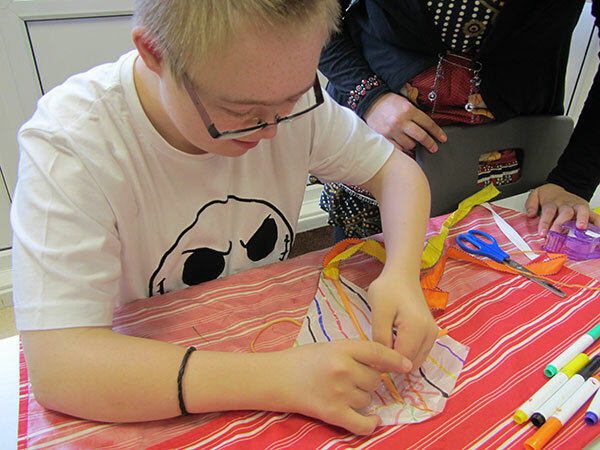 In 2010 for 18 months every Saturday morning during term time, we provided engaging and enjoyable arts activities to disabled children, young people and their siblings all of which had a wide range of disabilities which took place in Staffordshire (Ecceshall & Newcastle-under-Lyme). We offered music, music technology, digital media, film, photography, dance, drama, singing, ‘rock band’, visual art, pottery and crafts workshops all of which were rotated each week to ensure a variety of activities were offered and skills were gained. We employed 16 members of staff each Saturday and regularly engaged 30 participants. 528 children and young people (510 with a disability) took part in our two year after school clubs project. 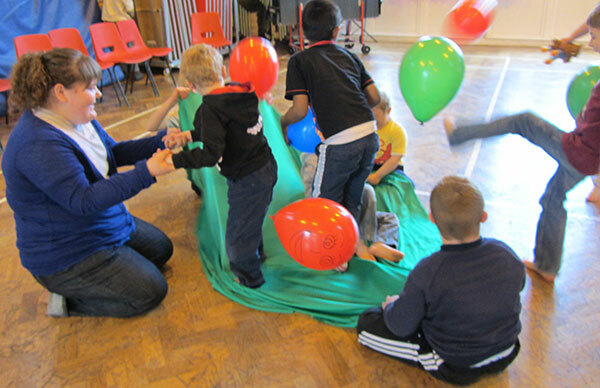 It involved delivery of 5 after school clubs and 2 lunch time clubs in Eccleshall, Leek, Stoke-on-Trent & N-U-L. Along with improved fitness levels, body and spatial awareness, our aim was to increase the participants teamwork skills, self-confidence, tolerance, focus, and at the same time raising aspirations by achieving and experiencing new opportunities and new ways to communicate. It gave disabled children a chance to socialise and make new friends resulting in gaining independence, reducing loneliness and isolation.